Belkin announces new adjustable Express Dock for iPad. Accessory maker Belkin has today announced its latest accessory for iPad: the Express Dock for iPad. Belkin claim the Express Dock for iPad is the first dock that can be adjusted so that you can dock your iPad without removing its case. The Express Dock achieves this by virtue of an adjustable dial integrated into the back of the dock that raises or lowers the Lightning connector so that it will be compatible with a variety of case sizes and styles. Express Dock is certainly built with the iPad (4th generation) in mind and is fully capable of supporting a 9.7″ iPad but will also be just as useful for charging and syncing your iPad mini, iPhone 5 or iPod touch (5th generation). It will probably work well with the new iPhone 5s and iPhone 5c too although Belkin do not themselves state this. It’s available now through Belkin’s website and retail partners, including Apple and Amazon, and costs $59.99/£44.99. 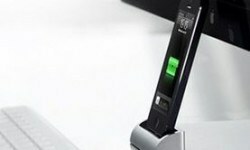 Belkin Charge and Sync Dock for iPhone 5 review: A stylish and practical addition to your desktop or nightstand. For years, Apple made an official dock to accompany a wealth of their products in the iPod and iPhone line. With the replacement of the 30-pin dock connector in theiPhone 5 with Lightning, many – myself included – would have hoped, perhaps expected a new dock from Apple to go with it. That never happened, and so we must look towards the third-party manufacturers, like Belkin. I recently picked up one of their Charge and Sync Docks, and it’s a pretty nice little accessory to have sat on my desk. It’s good, but by no means perfect. Let’s take a look. The dock itself isn’t bad looker, and though it may be constructed primarily of plastic, it has that same sort of metallic finish to it as a MacBook. As such, it doesn’t look at all out of place alongside your other Apple equipment on your desk. The inside is constructed of black rubber, with an in-built Lightning connector nestled in the middle. This is the main difference from the first generation of docks from Belkin, in that before you supplied the Lightning cable. The connector has a little flex to it, which I really like, because rarely do I ever lineup my iPhone perfectly straight. That little bit of give feels reassuring, and also allows you to dock while the phone is inside even a pretty thick case. The bottom of the dock has a rubber pad across the full length and width, so you don’t need to worry too much about knocking it and it sliding all over. It handled my glass desk just fine. All good then? Well, there is one criticism. The first iteration of the Charge and Sync Dock while needing your own Lightning cable, also had an audio connector so you could route your music out of the dock via the output on the back. This newer version doesn’t have this, which is a shame, as I’d have like the opportunity to hook it up to some external speakers. It’s a give with one hand, take away with the other kind of scenario. If all you want is a simple charge and sync station for your iPhone, then the Belkin is a great choice. It looks great on desk next to your Apple equipment, equally so on your nightstand. It’s a little disappointing that in gaining a built in Lightning cable, you lose the audio output, and while I’m very much liking this dock, audio output would be the icing on the cake. 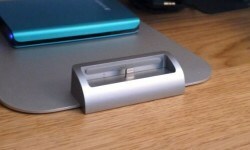 The OCDock Is An iPhone 5 Dock That Should Come Attached To Every iMac. If Apple sold an iPhone 5 dock designed to work alongside the iMac, then the OCDock would probably be it. Born on Kickstarter and provided by the fine folks at BiteMyApple.co, this device fixes to the base of your iMac or Apple Thunderbolt Display and provides you with a beautiful built-in dock that looks like it was always a part of your machine. The OCDock has a paper-thin wire that runs under the base of your iMac’s stand, so it looks like it’s completely integrated. It also has a spring-loaded base that moves up and down, so it will even accommodate your iPhone in a case — providing the case isn’t too thick. The OCDock has just one purpose, and that’s to provide you with an iPhone 5 dock that looks right at home alongside your iMac or Thunderbolt Display. But it takes that to another level by actually attaching itself to your machine; it’s not just a silver block that sits next to it. There’s a super thin piece of residue-free tape on its bottom that fixes the OCDock to the base of your iMac. This prevents it from moving around, and means you can pull your iPhone out of the dock without having to hold its base down with your other hand. And according to BiteMyApple, that adhesive strip is reusable, so even if you upgrade your iMac, you can continue using the OCDock with your new desktop. The OCDock is super simple to apply; just stick it to the base of your device — try to get it as close to the center as you can, or it just looks silly — then run its paper-thin cable under the stand and into the back of your iMac. Once it’s fitted, you won’t see the cable at all — it’s completely hidden. Even if your iPhone’s in a case, it should fit just as comfortably as a naked iPhone. Because it’s made of metal, the OCDock is super strong. It shouldn’t suffer too many knocks anyway, because once it’s fixed you won’t be moving it around. But it’s certainly built to last. The patented metal plate inside the OCDock is spring-loaded, so even if your iPhone’s in a case, it should fit just as comfortably as a naked iPhone. The dock also comes with additional rubber supports of different thicknesses that you can swap out to provide the best fit. 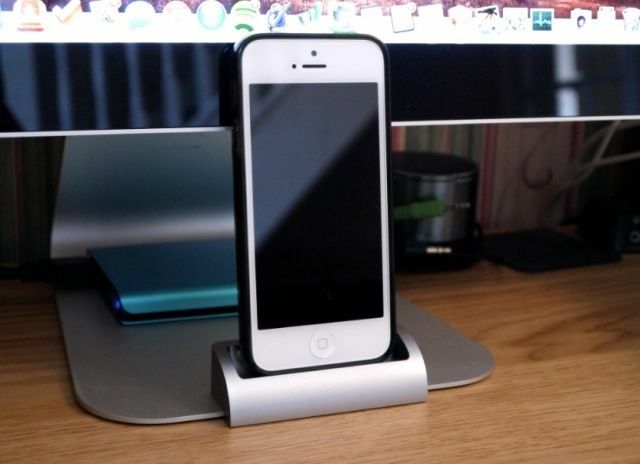 If you have an iMac or a Thunderbolt Display, the OCDock is possibly the prettiest dock you can get for your iPhone 5. It looks like Apple put it there. The fact that it’s fixed may be a downside to some, because you can’t move it around your desk. But it’s already in a perfect place. It’s right in front of your eyes where you can see it, but it sits almost underneath your iMac, so it’s not exactly taking up space you’re going to need for other things. But the question I’ve been asked by everyone who’s seen the OCDock is: Does the iPhone get in the way of the display? And the answer is no. Mostly. I have an old 24-inch Apple Cinema Display, and when I dock my iPhone naked, it sits level with the black bezel around the edge of the screen. So it’s doesn’t encroach on my dock. In my thin Belkin case, it sits over the edge of the display ever so slightly, but not enough to obstruct the icons in my dock. I’d say it overlaps by about a millimeter, but this all depends on the angle of your display and your eye level. Anyway, it’s certainly not something you need to worry about. One thing I have noticed is that, because the OCDock’s base is spring-loaded, your iPhone can be moved slightly from side to side, and back and forth white it’s docked. I stopped pulling before something broke, but I’m surprised I didn’t yank out the Lightning connector. Most of the time, this isn’t an issue because the dock doesn’t move. But you’ll need to be careful around it. When I pulled out my external hard drive from behind my display, it’s USB cable got caught around the iPhone and I accidentally pulled the iPhone forward as well. Fortunately I stopped pulling before something broke, but I’m surprised I didn’t yank out the Lightning connector. Perhaps that’s a testament to the OCDock’s strength and built quality. If you want an iPhone dock that looks awesome alongside your iMac or Thunderbolt Display, you’ll have a hard job finding one that beats the OCDock. It’s a little pricey at $79.99, and you’ll have to wait until April for it to start shipping, but it’s most definitely worth it. 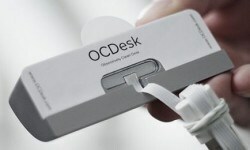 You can also get OCDocks that fit the iPhone 4/4S, and an OCDock Mini that has no sides. The Mini will also hold your iPad, but it’ll block your display, which is no good when you’re using it. The Good: Prettiest iPhone dock I’ve ever seen. You’ll want to buy an iMac just to use it. The Bad: It’s not shipping until April. You can’t move it around. The Verdict: It’s no wonder the OCDock was a success on Kickstarter. It’s a great product that’s well worth its $79.99 price tag. Save your pennies and order one! 3D Printed Adapter Puts iPhone 5 Into Apple’s Universal Dock. Got a “Universal” iPhone dock? Yeah, me too, and it’s pretty useless now most of my iDevices are Lightning powered. But Shapeways user nginear can help. He’s come up with an iPhone 5 adapter which will plug straight into your dock, letting you keep on using it for at least another year or so,. The 3D-printed adapter clips into the Universal Dock and provides space for the Lightning-to-30-pin adapter you should already own. There’s a back plate to support the iPhone, and a scalloped cut-out to make pressing the home button easier. The rub is that it costs $40. Or $40.01, to be precise. That’s in addition to the $29 you’ll pay fopr the 30-pin adapter. At least you don’t have to buy the dock – if you don’t already have one, you should probably look for a proper Lightning dock. Then again, this setup does allow you to use the Apple IR remote with the iPhone (or iPad mini) and hook it up to a stereo. That’s pretty neat. This iPhone Tank Charger Shall Rule Them All. World famous Singapore toy designer PHU has hand-crafted a futuristic iPhone dock that’s equal parts urban tank and robot all mashed up into one. For $395 each I would expect this thing to roll around my counter and play the Star Wars theme song on command — but that’s just me. You can see more of PHU’s epic original art at his online Deconstruct/Recreate gallery.